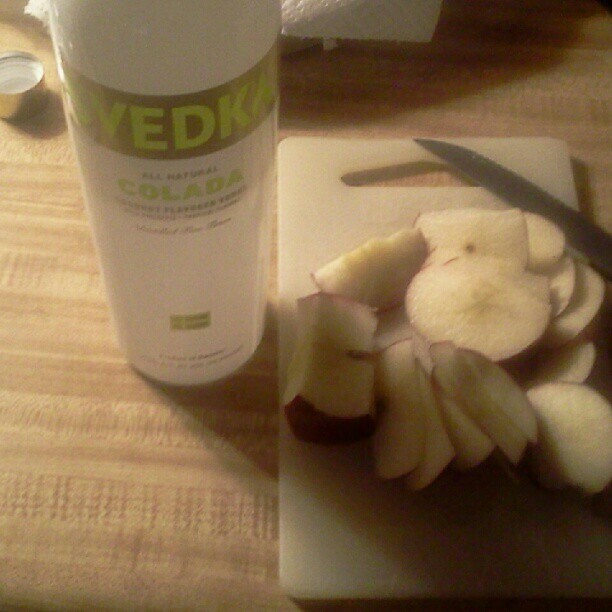 Great Cocktail Recipes: Svedka Colada and Fresh Apple = Infusion TIME! What up, blogging world? It's another infusion created by yours truly. Long story short. I was at a party last weekend and I copped the Svedka Colada because I thought it was great when I first tried it. It's actually relatively cheap where I'm at $13 for a 750mL. At any rate, I still had a bit more than half a bottle left and it was actually the perfect height for an infusion. Now, you all know, I do a bunch of infusion with things from vodka, wine, and rum. This time I actually used apples. I cut up small sizes and put it in a mix. The crazy thing is I ordered some Horchata today and I thought, why the hell not? Apple and Cinnamon go together. Why not a Colada mix? One of these days I will get that recipe on here, but for now you can check out some of my other infusions.